The affordable Kindle Paperwhite (7th Generation) will suit the needs of the average reader, but it lacks the waterproofing of the newer device. Amazon has continuously rolled out a number of fancy e-readers over the years. One e-reader staple, however, has remained tried and true: the Kindle Paperwhite. We acquired one and tested it over a week to see the perks and quirks of this device. 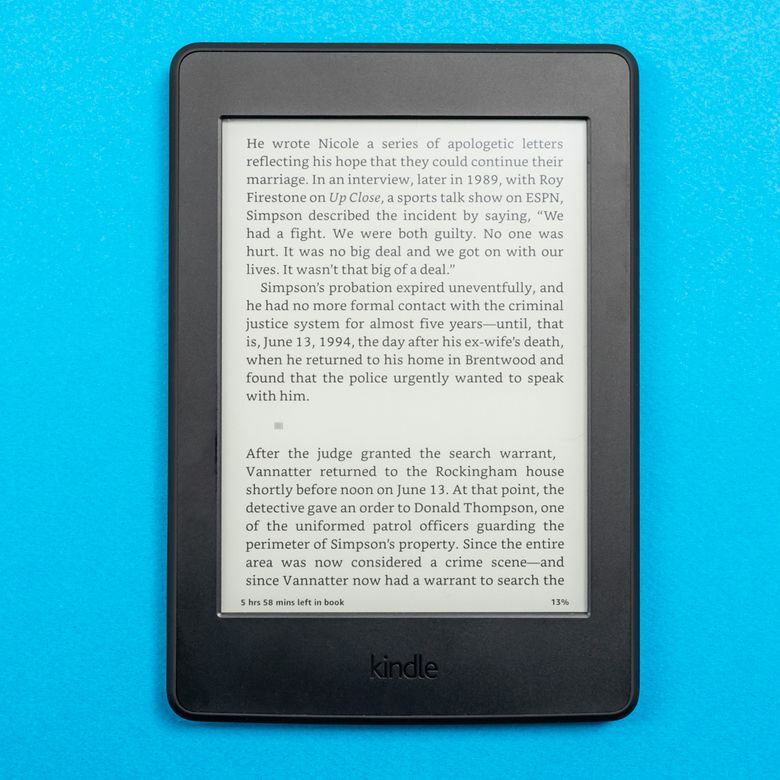 The most budget-friendly of options, this 7th generation e-reader provides all of the basic features of a Kindle, like a small design, the signature Kindle Store, without forcing consumers to lighten their wallets. At 6.7 inches by 4.6 inches by 0.36 inches (HWD), the Kindle Paperwhite is small enough to slip into a purse. It’s a bit on the heavier side, weighing in at 7.2 ounces. This isn’t a big deal at first, but could become an issue when holding it up for prolonged periods. The plastic bezel is raised up around the screen, giving it a slightly clunkier design, but making it less likely for you to accidentally touch the screen and flip a page without meaning to. The micro USB charging port and the power button located at the device’s bottom are the only plug-ins on the entire device. They jut out a bit but that doesn’t affect device use—it merely detracts from a sleek design. Aside from the Paperwhite itself, the only other item the e-reader comes with is a micro USB cord for charging anywhere. It would have been nice to get a wall plug-in, but it’s not a big deal since you likely have plenty of these lying around at home. Setting up the e-reader proved as simple and easy. It flips through general settings like language selection, setting up your Amazon account— or creating one—and connecting to WiFi. Once past the hard settings, Amazon filtered through other settings such as Goodreads, Social media accounts, and parental settings. These are optional, so if you want to get to reading and think about adding a Goodreads account, you can always access these features via the Settings button on the home interface later. Downloading a book onto the Paperwhite is very easy and user-friendly. At the end of setup, the Paperwhite provides tutorial screens, which show the consumer what everything is on the home interface and how to use it. While crowded, this home interface makes it easy to differentiate between sections. In total, the Paperwhite took us about 10 minutes to set up before we could start surfing the Kindle Store for some good books. The Kindle Paperwhite has a six-inch screen with 300 pixels per inch (ppi) promising clear, crisp reading that won’t strain the eyes. The Paperwhite sports 10 font styles—including one called OpenDyslexic, which is geared for those with dyslexia—and five different boldness settings. All of these result in crisp, clear words across the page with no distortions. It also offers 24 brightness levels with its built-in LED lights, so you can read on a darkened airplane. Even reading by the pool won’t be difficult, as the Paperwhite handles glare well at all angles, and won’t prevent reading in direct sunlight. All of these options make for a truly customizable experience that won’t hurt your eyes. We also tested comic books on this device. While you can read them clearly, the comics will only appear in various shades of gray and the size of pages doesn’t always scale well. Since most comics feature vivid colors, this detracts from the overall reading experience. You can certainly read graphic novels and manga on this device, but it’s not ideal for comics. Downloading a book onto the Paperwhite is very easy and user-friendly. Simply go to the Kindle Store or Goodreads, and from there, you can pick out a book that tickles your fancy. What we really enjoyed about the Paperwhite is how interconnected it is with other apps. For instance, Goodreads is a separate app (also owned by Amazon) that allows the user to see book reviews, average star ratings, and comments from others. You can add a book to you “Reading List” and when you’re ready, it’s saved via Goodreads on your home screen. Then, you simply tap it and it connects you to the Kindle Store for purchase. The Kindle Store itself is very easy to maneuver. Type in the book that you would like to purchase, and like the Amazon app or desktop version, it pulls up the results. One minor drawback we noticed was that the keyboard was slow to register and didn’t recognize some buttons we tapped. Slowing down our typing speed helped make sure the key presses registered. From the book’s page, you can download the book of your choice. The average e-book runs less than 10MB so you won’t have to wait long. We were able to download and start reading books within a minute. One quick and important note — the Paperwhite needs a Wi-Fi connection in order to purchase and download books. It’s a minor nuisance if you’re on the go and see a book you like. Also, when we tested it against our local libraries, we learned the hard way that the EPUB format (the most common e-book format) isn’t natively supported. You’ll need to download software like Calibre and convert it into the MOBI format the Paperwhite and other Kindle devices are able to read. In the Settings page, parents can set controls to keep their kids off of apps and in the books instead. These controls can limit access to the web browser, the Kindle Store, and Goodreads. One nice feature Paperwhite includes is a “Kindle FreeTime” app. Using FreeTime, parents can set reading goals, badges, and awards for reading books. Simply create a profile, add some books, and set reading goals. From there, parents can monitor their children’s reading choices and the goals on an easy interface—while making sure they don’t buy extra books! We tested out a 4GB Paperwhite. When we checked storage under the Settings tab, we noticed that 1GB was already filled with software and hardware for the device. This may seem like a huge chunk of the storage for the Kindle, especially since you can’t use a microSD card, however, putting the average e-book file size into perspective, one GB of data still holds around 1,100 books. That’s more than enough to carry a library on the go. While we would like to see it hold a few gigabytes more storage, this isn’t a deal breaker. If it starts to fill up, you can delete books from the device by tapping, holding the book’s cover on the interface, and pressing “Remove from Device.” For those who use Audible and prefer audiobooks, take note—this Paperwhite model isn’t compatible with Audible. Kindles are famous for their battery longevity, and in testing this particular Paperwhite, we have to agree. Once we got past the initial setup, we tested it over the course of a week for a few hours a day, playing with the reading features, Wise Words, and the Experimental Browser. Reading the Paperwhite doesn’t seem to drain the battery much at all. However, in testing Wise Words and the browser, the battery drained a little too quickly for our liking. Definitely stick with reading on the Paperwhite, if you can. With all of the use, after a week, we were down to 37%. It can definitely go longer without a charge, but the battery, once you factor in app usage, depletes a little too quickly. The Paperwhite claims it takes around four hours to charge, but we noticed it took less than two to do so. The Kindle Paperwhite (7th Generation) is a great e-reader for someone who only wants the very basics. Turning the screen off completely also preserved the battery life. One thing to note, the Paperwhite advertises books when you press the power button instead of turning off. At first, it’s not a big deal. As we kept testing it, however, they grew irksome, especially since we just wanted the books without the ads. Pressing and holding the power button for five seconds will power the Paperwhite off, but spare you from unwanted advertising. Ringing in at less than $100, the Kindle Paperwhite’s older model is very reasonably priced, especially considering the cost of some of the other, heavier-hitting models, which cost upwards of $200. While it doesn’t come with all the bells and whistles other models may have like waterproofing, for a basic e-reader, it more than does the trick. Keep in mind that this Paperwhite has been around since 2015, so it’s very likely Amazon will discontinue it after selling out its last bit of inventory. Amazon recently unveiled a new Paperwhite Kindle model, so we compared the two to see which one still reigned as the ruler of the basic e-readers. While the old Paperwhite’s design is a little clunky, the new Paperwhite has a sleeker build. The new model also has waterproof capabilities—a nice quality the older model lacks. Finally, the new Paperwhite also has more storage, holding 8GB compared to the older model’s 4GB. The price is a bit more, with the 8th Generation Paperwhite costing you around $100, which isn’t a huge amount but could be unnecessary if you don’t need the features it offers. If you’re simply looking for an e-reader to tuck in a suitcase or on a morning commute, or if you need a simple one for basic needs without the price tag, then the older model will suffice for your needs. However, that beach destination you’re flying to might require the waterproof capabilities, and in that case, we would definitely recommend spending the extra $20 for the newer model. Read more reviews of the best e-readers available to purchase online. Great for the basics, but lacking some features compared to the competition. The Kindle Paperwhite (7th Generation) is a great e-reader for someone who wants only wants the very basics. The price is one of the biggest appeals, but If you’re looking for more features, like waterproof capabilities and more storage, then you may want to spend a little more on a higher end model. Product Dimensions 6.7 x 4.6 x 0.36 in. How Does the Amazon Kindle Fire Stack Up?